In support of the National Breast Cancer Foundation and in CED’s concern for the personal safety and protection to our customers’ and their loved ones, we now offer two excellent protection products. Your first line of self-defense is as close as your key chain. In many instances you would have your keys in your hand anyway. 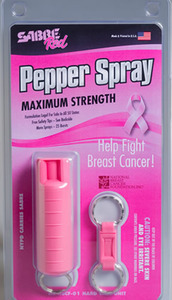 The SABRE RED Maximum Strength Pepper Spray is one of our most popular choices. Don’t allow yourself to be victimized.